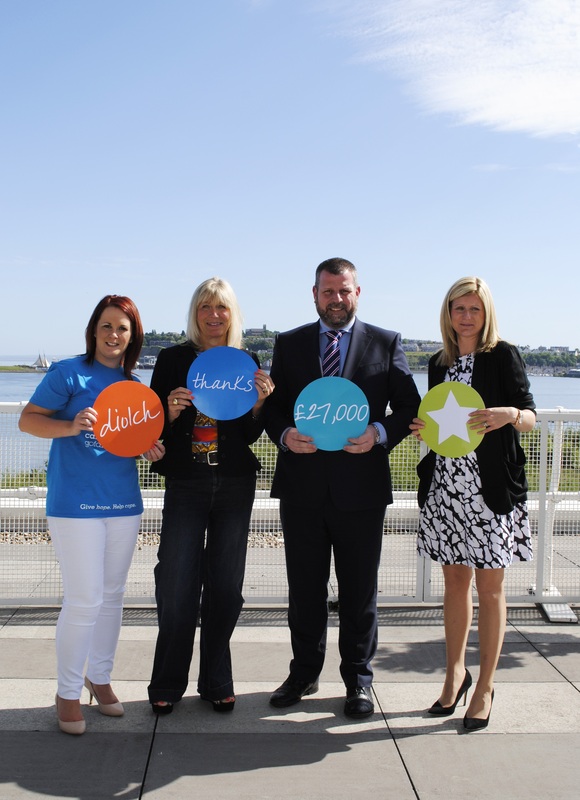 A charity zip wire event hosted by St. David’s Hotel & Spa has raised an impressive £27,000 for Tenovus Cancer Care. The cheque was presented to Chief Executive, Claudia McVie from the charity in a ceremony on the rooftop of the hotel this week. Over 160 people were sponsored to take part in this exhilarating challenge, which took place over two days in May. Brave participants flew over the Bay on a zip wire, beginning on the roof of St David’s Hotel & Spa and ending on a pontoon in the water. The event is just one of many fundraising activities that St David’s will be running with Tenovus Cancer Care over the next year as part of their Charity Partnership. Earlier this year they also hosted a Ladies Indulgence Night and launched a charity cocktail, the Tenovus Tempus, which is available at the St David’s Tempus at Tides restaurant and bar with 50p from every sale going directly to the charity. St David’s Hotel will also be hosting a fancy dress Halloween Ball on the 30th of October in aid of Tenovus Cancer Care. Tickets will go on sale soon for the evening which will include a 3 course meal and live entertainment. Tenovus Cancer Care is Wales’ leading cancer charity. They work to fund vital research and bring treatment, emotional support and practical advice to where it matters most; the heart of the community. St David’s Hotel & Spa is the only 5 star hotel in Cardiff. It offers 142 guest bedrooms, eight conference and events suites, and a stunning waterfront location overlooking Cardiff Bay Marina. The venue also offers the chic Tempus at Tides Restaurant and Bar and the world class Marine Spa which is regularly voted one of the top spas in the UK by Conde Nast. Graeme Barclay, General Manager of St David’s Hotel & Spa said: “We are extremely grateful to everybody who was involved in the zip wire event, not only the daredevils who took part but those who came to show their support and encouragement. A lot of hard work went into organising it and we are delighted that the event raised such a staggering total.